With the new school year in full swing, homework, studying, and afterschool demands are rapidly rising. For many students, this means figuring out effective ways manage their time, organize their materials, and memorize information for quizzes and tests. While some students are naturally able to identify effective study skills techniques, most benefit from learning structured, systematic tools for improving their study habits. Help your child stay on top of his workload with the techniques detailed below. 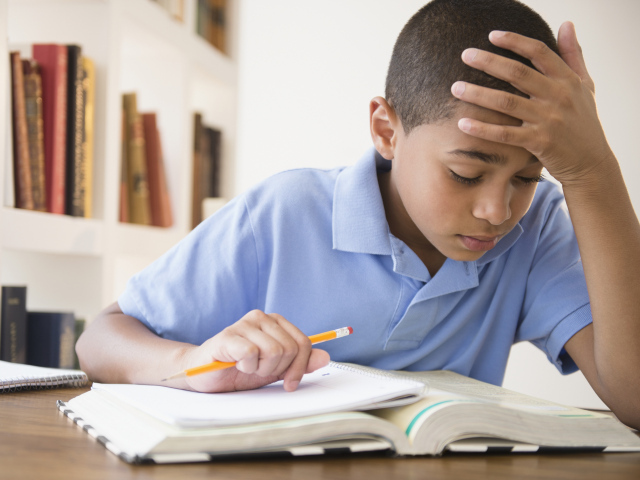 Most of us know children who become easily distracted when trying to complete their schoolwork. A missing writing utensil, background noise, or wandering thought can quickly veer them off task. Identifying triggers and coming up with ideas to avoid these distractions can help students sustain their attention and complete their tasks. To build this focusing ability, it is helpful for students to identify distractions and then come up with a solution for each one. Encourage your child to create a sheet with two columns: Distractions on the left and solutions on the right. Have him list each distraction with a corresponding solution to the right of it. In doing so, he will become much more self-aware of distractions and ways to solve them. As students move through school, they tend to receive more quizzes, exams, projects, and assignments. As such, effective time management skills become increasingly important. For many students, knowing how much time to allocate to a given task can be challenging. A key element of time management is learning to understand how long tasks take to complete. To build this skill, start by explaining to your child that ET stands for estimated time, or the amount of time she thinks it will take to complete a task, and AT stands for actual time‎, or the actual time it takes. Then try various activities at home to practice this skill. For instance, one task may be to sharpen five pencils. Ask your child how long she thinks it will take to sharpen five pencils and write down the ET, or estimated time. Then have her time herself to see how long it actually takes and write down the AT, or actual time. Then, have her apply this method to her studies by keeping a notebook where she writes down the estimated time for each assignment, and uses that to decide on the method for how she approaches her work—making sure to track the actual time it takes her to complete each assignment. When students first use this strategy, there is often a large discrepancy between estimated and actual times, but with practice these times tend to merge as they develop more effective time management skills. The task of learning a large amount of information and retaining it for an exam can be overwhelming for many students. Two-column study guides can help them combat this challenge. Rather than sorting through piles of flash cards, ripped out notes, and endlessly highlighted textbook pages‎ in a hopeless attempt at studying, students can feel well-organized and well-prepared for their exams with these guides. To create a two-column guide, your child should turn a horizontal sheet of paper into four parts. He should label the middle two columns “Questions” and “Answers.” Next, he should come up with a series of questions and answers based on the information he needs to learn. He should write the questions under the “Questions” column (second of four columns) and the answers under the “Answers” column (third of four columns). He should then fold over the first column on the left to cover the questions, and the fourth column on the right to cover the answers. He can then quiz himself as many times as needed until he grasps all of the information. These guides serve as an organized, consolidated method for learning exam material. Many students argue that they can remember all of their assignments, including the materials necessary to complete them, without writing them down. Yet as students move through school, this super-power becomes less and less realistic. It is important for students to begin using a homework planner regularly, starting at a young age. In class, they should write down all of their assignments, with as much detail as possible. At home, they can estimate how much time they think each assignment will take and compare it to the actual time. They should also cross each task once it is completed and put in its proper place to be turned in. If, however, your child continues to forget to write down her assignments, you can try using the “box” reward system. To do so, next to each day in her planner, draw a box. If your child completes all of her homework and ‎turns it in on time, she colors in the box green. If she does not complete and turn in all of her work, she colors it red. If she colors five green boxes in a row over five days (or whatever number you feel is appropriate and attainable), she receives a pre-determined reward. This type of reward system can serve as a catalyst for kick-starting top-notch homework habits.